Some San Carlos residents are complaining of health problems after dust from an illegal dump site sent a cloud of debris over a neighborhood. "I saw a brown plume of dust coming into our neighborhood, the sun blotted out and the air smelled terrible," said Ben Fuller, president of the greater East San Carlos Neighborhood Association. Fuller said the incident occurred on Saturday, when winds kicked up dust from a pile of construction debris, blew across the Caltrain tracks and into his neighborhood. The debris consisted of old pipes dug up at a nearby sewer and water project. 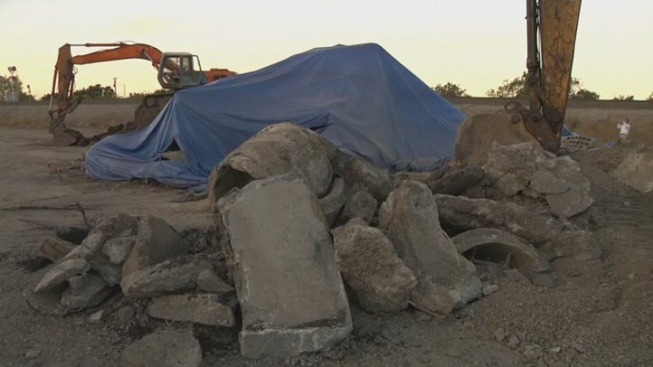 A spokesperson for SamTrans, which owns the land where the debris was left, said the materials found at the site is an illegal dumping by one of two sewer project contractors. SamTrans never agreed to use the area as a dump site and has no idea what type of materials are in the pile. Another neighbor who did not want to be identified reported experiencing coughing and shortness of breath after breathing in the dust that traveled to her house. The City of San Carlos, which hired the contractors, did not return calls seeking comment on this story late Tuesday. But Fuller said city officials talked to him and was told the dust was tested by an independent agency, but has not been informed what is in the land. NBC Bay Area was unable to reach contractors late Tuesday for comment. SamTrans said it has not discussed legal action.